Senior forward Kelli Prange backs down her opponent during a women's basketball game against Dayton Sunday. Women’s basketball rode the momentum of the Smith Center crowd and mounted a comeback against Dayton Sunday afternoon. After trailing by 12 points, GW tied the game up with less than two minutes remaining. But the Colonials (12-11, 7-5 A-10) were unable to score for the rest of the contest and fell to the Flyers (20-4, 13-0 A-10) 57–53 in the two teams’ second meeting of the year. The loss snaps a season-best three-game winning streak for the Colonials, leaving them tied with Saint Louis for sixth place in conference standings. With the win over the Colonials, the reigning conference champion Flyers remain the only undefeated squad in the Atlantic 10. Earlier this season, the Flyers outlasted the Colonials when the two teams met in Ohio Jan. 21. Rizzotti said the team has improved since the road loss against the team and felt confident before the game that they could compete. Senior guard Brianna Cummings led the Colonials with a game-high 17 points and added three rebounds, one assist and three steals. Junior guard Mei-Lyn Bautista and senior forward Kelli Prange followed with eight and nine points, respectively. 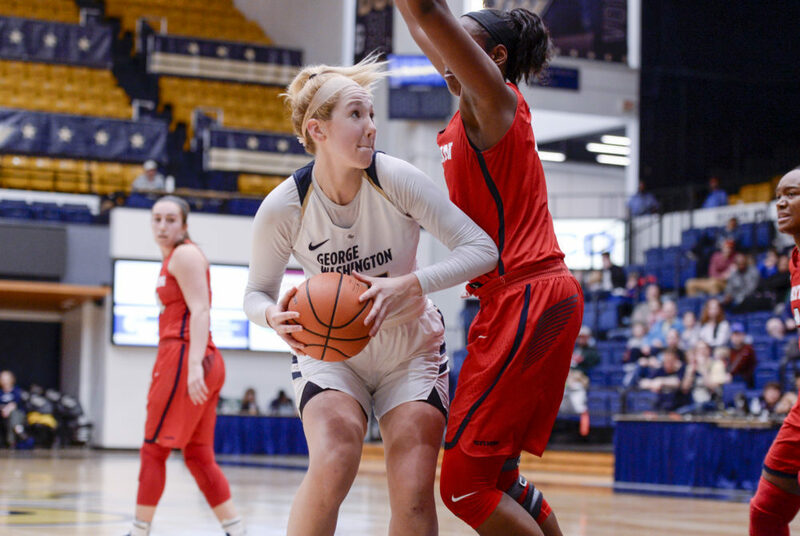 GW began the game with a 5-0 run, with a three-pointer from senior forward Kelsi Mahoney and a pair of shots from Bautista at the charity stripe. The Colonials played efficient defense in the first quarter, keeping the Flyers scoreless for more than four minutes and drawing two offensive fouls. Despite a strong first quarter, GW was unable to stop Dayton as they took control in the second quarter, scoring 21 points and shooting 50 percent from the floor. The Flyers put a stop to GW’s offensive success, playing tough defense in the first half and forcing three shot clock violations by the Colonials. “We always know it’s going to be a tough game and they make it hard defensively for us to score,” Rizzotti said. The Colonials went into halftime trailing 29–24 and let the Flyers maintain control coming into the third quarter, trailing by as many as 14 late into the quarter. The third frame ended with a shot at the buzzer by the Flyers, extending their lead by 12 points going into the last 10 minutes of the game. It wasn’t until the fourth quarter that the Colonials brought their energy. They opened the period with an 8-0 run, forcing a five-minute scoring drought on the Flyers. Even though the Colonials played their best in the last 10 minutes of the game, scoring 16 points and out-rebounding the Flyers 10-4, the time ran out before the comeback was completed. The Colonials will be back in action Wednesday for their Pink Game as the take on Massachusetts at home. Tipoff is scheduled for 7 p.m.